If you maintain your own car, van or motorbike you need to make sure you look after the used oil when you change it so it doesn’t pollute your local environment. If you maintain motor vehicles as your business this advice doesn’t apply; you must use an approved, registered/licensed waste contractor to dispose of your used oil. Have an oil spill kit to hand; you can buy one from car part suppliers, large DIY chains or online. Use a drip tray or purpose-made sump canister to contain the oil as you drain it. Store your old oil in an appropriate container until you can dispose of it. Make sure the container has a secure lid to reduce the risk of spills as you transport it to an oil recycling bank. Don’t pour your oil down the drain or onto the ground; you would be causing pollution and breaking the law. If you are found to have caused pollution you could be prosecuted. 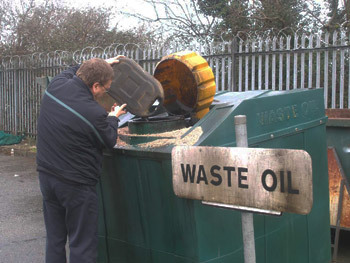 Take your used oil to an oil bank to dispose of it safely and legally. To find your nearest oil bank check the oil bank web site at www.oilbankline.org.uk, telephone 03708 506 506 or contact your local authority recycling officer. Don’t mix your used oil with brake fluids or anti-freeze. Dispose of other waste liquid from your vehicle separately at local amenity sites. Never tip, wash or hose oil down a drain or gully; dispose of it correctly. Don’t mix detergent with oil, this makes the pollution worse. Stop spilt oil entering drains by using an oil spill kit or even sand or earth. Bag-up any contaminated material and dispose of as oil contaminated waste. If you want advice about a spill, call the national incident/pollution hotline 0800 80 70 60, the line is open 24 hours, calls are free from land lines but there may be a charge if you’re using a mobile. Remember oil and water don’t mix – please help us keep them apart.